I got more color done in the middle and some of the variegated edging done, too. I like the colors I've got on this and hope to get it done by the end of June. Since I had two anchor points, I decided to work more on the border lines between the eggs. I'll be working more on both the lines and the side egg next week. I had a finish this last week and it's my first finish over one. This is the Petite Monogramme aux Griottes from Rouge du Rein. I'll be making it into a tiny biscornu scissors fob, I think. I've gotten some comments asking how I do this, so I'll post. It works for me; I don't know if it'd work for anyone else, but... here goes. Everything changes when I travel, too, and gets discombobulated, so that's one reason things get out of order sometimes. This is how I set it up when I got home from Kosovo at the end of April. First, I get a sticky note pad with ten lines on it. I write down the project I am currently stitching until I have ten projects on the list. Each project gets two needles-ful of stitching done. Sometimes I'll fudge and do a bit more, sometimes a very little bit less. I do try to keep at least that much on each project. It's enough to see progress on it. So, ten projects that I go through from top to bottom and keep going through until one's done. When one is done, I tear off that sticky note and write a new one with all the same projects except the completed one and then add a new one to the bottom. Adding a new one is my reward. Right now, I'm alternating between adding completely new projects when I finish one and old UFO's. I also try to work extra on a project every day. Since I've been so behind on the stitchalongs, I've been doing them. I do two needles-ful of that project until it's done, or in the case of the stitchalongs, I've completed a section. Then there are the crazy quilt round robin blocks. Because they're on a fairly short turnaround, I tend to put aside a day a week to work on them. Usually, that day is Sunday. I tend to work on that until I'm done or until I get too tired of it. When I do, I'll put it aside for the day and pick it up as the daily item until it's done. I doubt this makes sense to anyone else, but it's how I've been doing things for several years now, at least. Next to the cream colored building, I've been stitching a dark brown one this week. I'll be working on it next time, too. This side is coming along pretty well, and I might make my goal of finishing it by the end of summer - then three more sides. I swear I'll get this done! It's only been in my rotation three years now. This week, I finally finished the last bit of red at the bottom of the flag. This means the flag's done. Now I've got more skirt to do and then the bottom flourish. It's getting close; I feel like finishing the flag's a pretty big milestone. You can tell I'm getting close to finishing this one. I completed part seven this week and have part eight in my inbox. I'm going to finish part five of See the Stars before I do part eight of this, though. I'm glad I went with my colors. I like them better than the original. It only took me a couple of days to do it. I stitched part five of Marquoir's Zentangle. I'm now only two parts behind on this, so I'm catching up on everything gradually - at least, I'm completing parts in less time than they're releasing new ones! This is Cindy's autumn round robin block. As you can see, it came to me already three dimensional. I was the first to stitch on it; I think the ones who stitch later will have an even harder time. Cindy said it was to be The Great Pumpkin, and I'm not really someone who does Halloween, so I put a bunch of harvest-type stuff on it and some copper and natural materials. My husband really liked the spider on its web, for some reason. That was the part that took the least amount of time, too. There were eight total sections; I did two and two seams, and chose an edge because it was easier to work on. I don't know how whoever gets the middle is going to be able to gather everything together and get in there to do it. Anyway, it's mailed out to Cobi today and I hope Cindy likes what I've done. I did quite a few scotch stiches this week, all the same color too. They were the middle color of the five pinks. Although I'm only just over a third of the way through the thirty pages of instructions, I -think- I'm over halfway through the actual stitches. It looks more than half covered to me, at least. We'll see. Yup, this week I started Bibebdum's bike. He's going to be styling away soon, and I'm soon to be done. I'm guessing he'll be complete by Labor Day. The central area got a lot of work this week as I added in most of the color that was supposed to be a solid DMC. I substituted a Vikki Clayton variegated. I think it looks pretty good in there. Anyway, there's a -lot- to part one, and the group ends in a week, so I'd better get working more. Yay, another finish this month! This is Vera-Ellen's block and it's smaller than the rest of the group's. As you can see, there wasn't much space to work with, so I did what I could. I added blue flowers on the diagonal to balance each other out, outlined the ribbon with beads, added a spray of irises, and did the top seam treatment. It's a pretty full block now and will be sent back to the owner today. Yes, the second of four of these eggs is started, and I've begun the outlines between the eggs, too. Maybe I'll concentrate a bit more on this when I'm caught up on the crazy quilting and my stitchalongs. Yay, I finished part four. Now I just need to get part five done before the end of the month and I'm all caught up. I adore how the colors are coming together on this. It's something I'll definitely keep and treasure when done. After this week, I have all of two or three more measles, or rather cherries, to go! It's getting much closer to being done every week, but I thought I'd have it completed much sooner. This week, I made quite a bit of progress on one of the buildings on the left. I added the red above the roof of the stable and a variegated pearl around that. It is mixed with a variegated caramel color, but the part that ended up used there was very light, so there's not much contrast. Maybe the house on the other side will get more. That's one of the things about working with variegateds - no two stitchers will have the same look. I like that. This restaurant is a two minute walk from the hotel, across a park. We went there the first night we got in - after our twelve hour harrowing drive from Varna. We were exhausted and hungry, and this place welcomed us even though it was late in the evening. These pictures were taken on our second visit, on our last night in Bulgaria. Yes, it was that good. 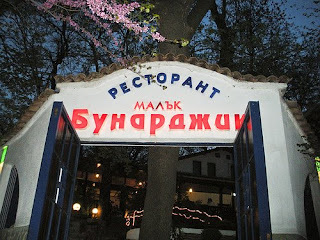 By the way, if you go to the Balkans - the Cyrillic parts - memorize that top word. It's pronounced "restaurant". Here's a picture of the building itself, past the sign. There are fountains and pools and tables all over the front are, and a very pretty garden. It was a bit chilly when we went, so the area wasn't open to sit outside. 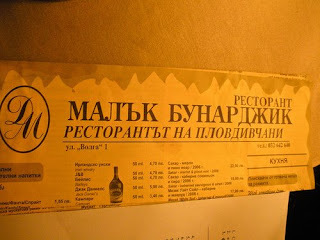 And this is a picture of the menu. It's all in Bulgarian, but there are somewhat cryptic English translations below. Most restaurants in large cities in the Balkans have English translations on their menus. They may or may not be correct. This was our main course, and it was wonderful! 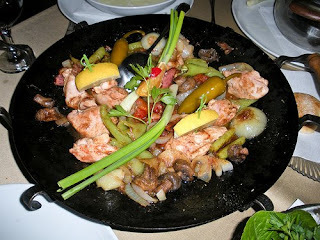 It's grilled chicken and vegetables with lemon, served in a wok-like dish. 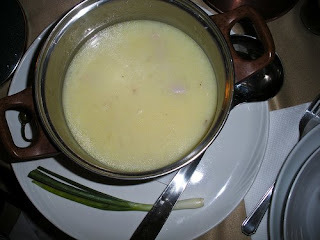 They called it chicken in a pot in English (I told you their translations are a bit off!). Everything had a hint of paprika that went wonderfully with the lemon. My first course was chicken soup. It was served in its own tureen, complete with ladle. Lots of actual chunks of chicken in a mildly spiced broth. When we took a picture of it, the owner saw what we were doing and gave us free shortbread cookies because we liked the food so much! They were good, too. The check, by the way, was about 25 lev for both of us, translating to about 12.50 euro or less than $20. Overall, don't fear the food in Bulgaria. Most of it's very good. There's only on restaurant we went to where the service and food were subpar. It was a pizza place in Varna. I'm almost done with the widest part of Bibendum! Probably my next work on him will be finishing the belly and starting work on the bicycle. Yay, back to a third color in the mix! I'm over halfway done, too. More color, all blues and greens, as I started the middle of this. I think the design's pretty, although I have a problem with the chart. A large part of the backstitching and special stitches is in gold. It's shown in the chart as yellow lines and is very hard to read. The puppy has a home. As late as Wednesday, we thought she would be coming back to the US. 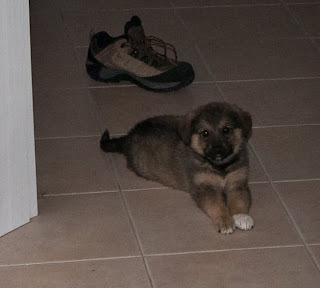 Instead, at the last minute, she was adopted by a Kosovar shepherd. Yes, they still exist in the Balkans. She will be his companion as he works and have a good home. She'll be doing what she was bred to do. I'll miss her, though. Still in catch up mode, I started part four of See the Stars this past week. Since this picture was taken last Friday, I've finished the part and am now "current", in that I need to have part five done by the beginning of June. A picture of the completed area will be taken tonight. Yes, I've finished my third quilt block round robin this month. This block is Ati's Anything Goes block. Her theme's a garden, and so I did a nice flower in the lower left corner. Added more stuff... hope she likes it. Top is before my work, bottom is after. All the curves are beginning to come off now. It's getting the final squaring off. I'm so close to getting this done, I keep thinking, but the actual size of the piece is deceptive over one. This week, it was all about the ribbon on the Lady's side. She's coming along, and I'm beginning to feel good about her progress. I worked mainly on the inner part of the compass rose this week; it's coming along, though like every other project, more slowly than I'd like. I finished Zentangle part four last week, and have the next part to do in my pile. I'm slowly catching up with my stitchalongs. I still really like this even though the colors are so not me. I made more progress on Camelot this week. It was all Scotch stitches, working on the shading in the four outer areas. I'm getting to the point where I can declare this halfway done, I think. I'll do another Bulgarian post on Tuesday and a couple of Kosovo ones later in the week. This is the second of the crazy quilt round robins I'm finishing this month. It's Bonnie W's, and all her blocks are neutral. I picked this one because it was the only one without a really discernable fan in it, and I'm different. I spent a while figuring out what to do and then did several things. The gold little appliques are from the Bulgarian fabric. My favorite, though, is the four petal flower seam treatment. I hope she likes it. There were so many small bits that it was hard to work motifs for most of the pieces of fabric. Surprisingly, this also makes my fourth finish of this month. I come home from Kosovo and get productive, I guess. I started this on the trip from Pristina to Vienna and worked on it some more between Vienna and Paris. Got a lot done! It's the second workshop from Chatelaine, this time focussing on rice stitches. I'm still working on getting the outline done. I really like these colors - I gravitate toward the cool ones. As you can see, though, it's a small piece, so I have a chance of finishing it relatively soon. If you'd like to participate in the Christmas in July ornament exchange, click on the Christmas Ornament Exchange link on my sidebar. Sign ups end June 1st and mailing date is July 15th. This has been successful in the past, and all manner of embroidery is encouraged. Yay, I finally finished the second of the charity hearts! It's going out to Germany today. I really fell in love with Plovdiv. You've probably never heard of it, but it's about an hour or so southeast of Sofia. Skip Sofia. Go to Plovdiv. The architecture is amazing, there's plenty of stash to shop for, and it's the only place in Bulgaria we saw where everyone smiles back. 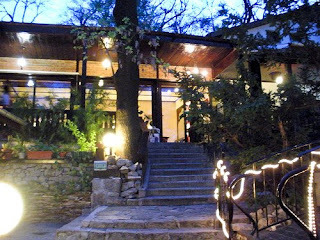 Anyway, this top picture is of the Ethnographic Museum. It's chock full of beautiful things, and the building itself is pretty spectacular. All of it was hand painted. Here's an example of what's inside the Ethnographic Museum. It's a mural of icons. I just thought it was really pretty. 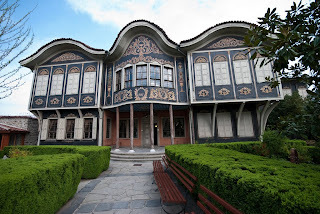 For more pictures of the Ethnological Museum and its contents, go here. 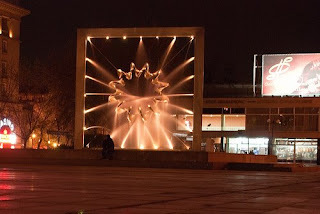 Here is a picture of one of Plovdiv's public fountains at night. It's right in front of the headquarters of the local orchestra. I just liked the novelty of it. The weather we had was near perfect, not too hot, not too cold, and not rainy. This picture is of part of the exterior of the Saints Constantine and Elena church in Plovdiv's Old Town. 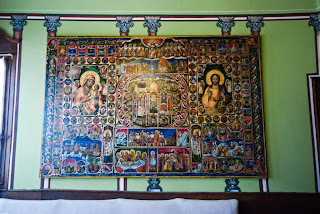 Both inside and out, the church is covered in hand painted frescoes. They're gorgeous. While we were visiting, there was a baptism going on inside. 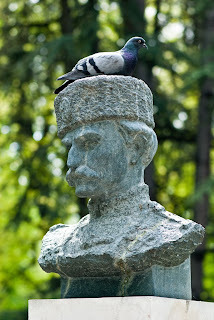 I have no idea who the guy is under the pigeon, but it was just sitting there perfectly pleased. There are a bunch of statues and busts in the very wooded public park at the foot of the main shopping road/area downtown. 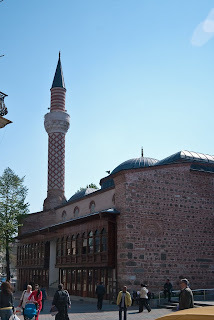 This mosque was the most prominent we saw in Bulgaria. It's in a central square right next to the ruins of an old Roman amphitheater and the main shopping area. 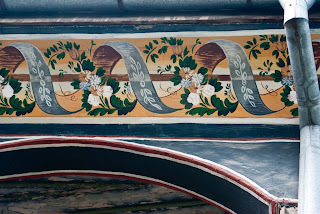 The outer area is really detailed wood carvings. Anyway, I -loved- Plovdiv and feel we didn't spend enough time there. I'd really like to go back. As my companion loads up more pictures, I'll share a few more with you. I actually received this block in Kosovo, but was unable to work much on it while there. So, since I now have a stack of about seven round robin blocks since my return, I thought I'd better get busy! Here's the first one to go out - I sent it today. It's Candji's from the Whatever Goes group. This top picture is the naked block. I did two motifs. One was a crewelwork flower, all in Appleton wools. The other, the gold, is from some of the fabric I bought in Bulgaria. I thought it looked good against the green. I also did a seam just above the crewel. It went out today. I hope she's happy when she gets it back. When I got home from Kosovo on Thursday, I had a huuuuuge stack of mail to go through. One of the things in the mail was my Asian Nights block. I'd actually forgotten about it. Anyway, it came back gorgeous. I'll probably add a little bit more to it then make it the center of a regular quilt. Thank you to the ladies who worked on it! This is the last of my stash purchases. 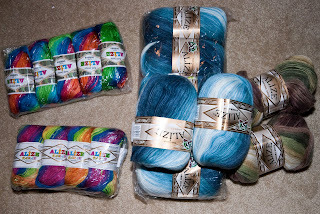 I got more Alize yarn, including bright cotton and bright bamboo. I just loved the colors. The blue mohair will be done up into another afghan. I wonder if the company has any plans to export to the US. I'd buy it.